After a long 25 year wait, One Bad Pig- the quintessential Christian punk rock pioneers- are back with Love You To Death. A lot of bands would have trouble recapturing the magic after a quarter of a century of being apart, but not One Bad Pig. In fact, they’re just as good as they were when they were going strong. Love You To Death, as the OBP sound we all love. Funded via Kickstarter and featuring a few lineup changes, One Bad Pig haven’t lost a step on any horizon. Lyrically, this is exactly what One Bad Pig have always been about. On Love You To Death they’ve very open and blunt about their faith and telling people what they need to hear about the Gospel. Many of the tracks- as always with a OBP record- are sing along anthems that will find their way into your subconscious, make themselves at home and say there. “Sunday Skool Rawk” is one of the standouts, featuring many of the Bible songs we learned as kids. “OMG” is another- which stands for on a mission from God- which is just genius. Musically, the band is better than ever. Of course, that’s to be expected since the band has kept in touch with each other pretty well over the years. The chemistry and connection is still there and it’s very recognizable. The Christian punk pioneers have always worn their faith proudly and been blunt and honest about what they believe. With songs like “Judgement Stick,” “Footwashin’,” “What Does The Fool Say” and others, it’s very clear that the band is out to spread the Gospel and bring The Great Commission to life. They do a spectacular job of that as well. Then there’s the cover of The 77’s “The Lust, The Flesh, The Eyes & The Pride of Life,” which does the original justice and breathes fresh life into the classic. 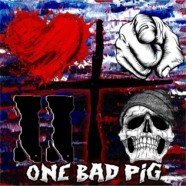 One Bad Pig have always loved doing covers- who can forget their insane cover of Petra’s “Judas’ Kiss?” This one is definitely one of their best revamps yet. When it’s all said and done, One Bad Pig haven’t just reclaimed their throne (I’m not sure anyone ever took it in the first place), they’ve solidified themselves as one of the most legendary Christian bands of all time.